Thanks to digital graphics and design, modern art has been taken to mind-bendingly cool new levels. 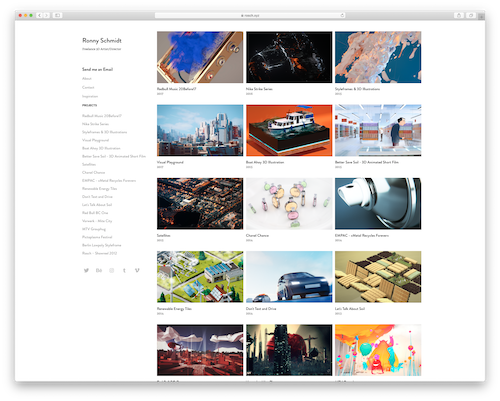 Our #WebsiteWednesday this week, Rosch.xyz, is one of the most talented connoisseurs of this new illustration technology, and his work with Nike and Redbull is sure to inspire your creative side. Ronny Schmidt, aka Rosch, is a Berlin based 3D artist who utilizes his skills to create vibrant, captivating animations both for commercial clients and as personal creative projects. Rosch freelanced for years before starting his current position as 3D Director of CATK studio, and his client list includes internationally recognized brands like Nike, Google, Balenciaga, Red Bull IBM, Chanel, HBO, MTV, and Mercedes Benz. His installation for Nike as part of their Strike Series was a visual exploration of athletes in motion, using suspended 3D blocks to create unique outlines of bodies in action. If you are a music fan, you’ll really enjoy the video shorts Rosch created for Red Bull Music’s 20Before17, which utilizes music production-inspired imagery to paint a picture of the creative process behind music composition. His work for MTV as part of their Grouphug campaign will leave you with a warm and fuzzy feeling, as the video spot celebrates the vibrant color of friendship and sharing. “My inspiration to create Rosch.xyz was simply to have a nice online portfolio showcasing my work as a 3D artist/director. There are countless creative individuals coming online today that are eager to share their impressive talents and unique perspectives with the world. Luckily for these artists, .xyz is there to help them build a portfolio on which they can broadcast their abilities to a worldwide audience, just as Rosch has with Rosch.xyz. If you’re craving more of Rosch’s work, check him out on Twitter and Instagram. To get started on your creative journey, follow in Rosch’s footsteps and get your personal portfolio started on a .xyz domain today. Email inboxes can be a major source of anxiety thanks to seemingly endless amounts of spam, newsletters, and subscriptions flooding them daily. Wish you could take back control of your inbox and declutter it without having to sacrifice your privacy? Then get yourself acquainted with this week’s #WebsiteWednesday, LeaveMeAlone.xyz. “James and I find managing emails a huge drain on time and productivity. Spam emails plagued us daily and we wanted a service which would show all of the email lists we were subscribed to and allow us to unsubscribe easily. We found a few services that would help us for free, but that’s because they make their money by selling all of your data for marketing purposes. With it’s high usabiliity, low cost, and complete privacy guarantee, it’s not surprising to find that Danielle and James have already met that goal. 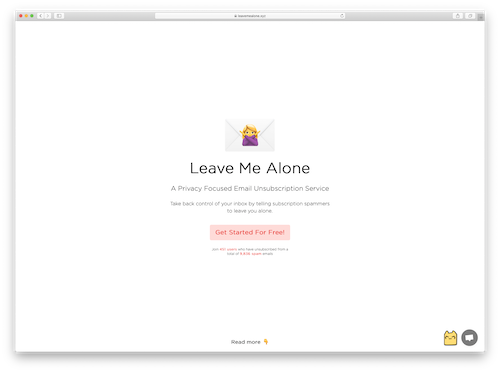 LeaveMeAlone.xyz has received rave reviews on ProductHunt and Twitter, with users praising the service and recommending it for anyone who deals with inbox clutter. Danielle and James count on .xyz as the platform to help their idea reach a global audience, and their product is making a major positive impact by targeting one of life’s biggest and often most overlooked headaches. Keep an eye out for Danielle and James, as they are no strangers to using .xyz domains and will almost certainly be popping up in a future #WebsiteWednesday soon! If you’re a creative person, the best way to let every part of your unique personality shine on the web is through your own personal website. But how do you decide what to put on it? What should be the theme? If you need inspiration for how to build a perfect personal website, then look to this week’s #WebsiteWednesday, Liucid.xyz. Annie Liu, the creator of and personality behind Liucid.xyz, is a designer at globally renowned marketing and PR firm Ogilvy. But to sum her up simply by her resume would be a disservice, as you’ll learn within minutes of browsing Liucid.xyz. Annie has crafted a style all her own, a cartoonish yet minimalist aesthetic which is simultaneously abstract and inviting. In her career she has designed advertising material for companies like Purina and Tresemme, but her featured work also includes pieces she made for UCSD Guardian and A Women’s Thing magazine; work which received high praise and even earned her a Red Dot Award in Communication Design. Visual artwork isn’t Annie’s only forte, though. She also features her original self-help style writing pieces, like Now What? On Navigating Rejection and Falling Short_Bridges and Fires. Looking for more motivation from Annie? Then check out her podcast curation project, in which she chose podcasts fitting 5 different themes for each of the 5 work days of the week, along with a guide to the themes of each day and unique illustrations to go with them. While social media is ubiquitous in our lives today, it can never paint a full picture of what an illustrator, designer, storyteller, or innovator is all about. 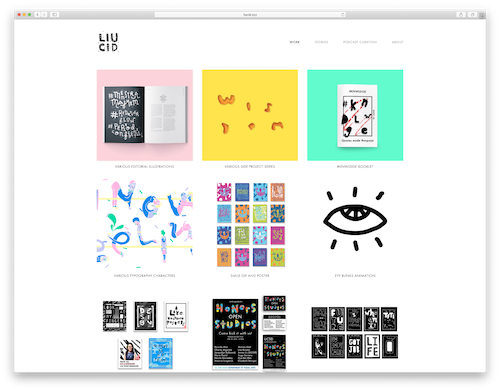 Liucid.xyz is how Annie Liu showcases not only her work, but her creativity, her style, and her wide range of talents. Ready to let the world see everything you’re capable of? Take after Liucid.xyz and create your own personal .xyz site. For years, companies around the world have been moving their promotional efforts to video-based advertising. If you look around the web, it begins to seem that every size business is using pre-roll ads or creating custom videos that give an elevator pitch about their business. So how do you get your business’ video ad to stand out from the crowd? 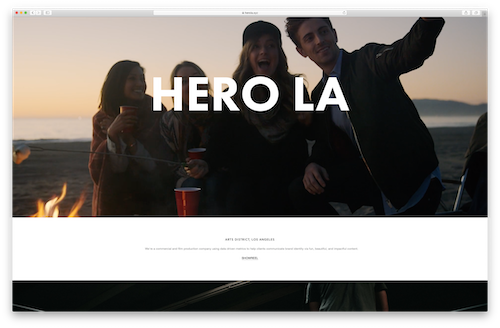 Get the help of this week’s #WebsiteWednesday, HeroLA.xyz. Los Angeles based commercial and film production company HeroLA.xyz isn’t like other video production companies. They stand out by using a metrics based approach, while also offering the highest quality video production, all wrapped in a superbly creative video package. HeroLA.xyz’s team is comprised of filmmakers, creatives, and techies alike that help craft a unique blend of analytics and artistry. They also have support from their partners in the digital marketing and film production industries, with industry leaders like Revyrie, Magnitude Digital, Digital Sandbox, and Native Lift aiding the HeroLA.xyz team in content creation, filming, and promotion services. In addition to this wealth of experience and breadth of resources, HeroLA.xyz’s portfolio of past work is filled with recognizable clients, from Nissan to Hope Solo. You can see HeroLA.xyz’s complete body of work on their site and get a true feel for the high quality video marketing content you’ll receive when working with them. When #GenXYZ members start a business, they stand out no matter how vast their competition may seem. HeroLA.xyz stands above the rest of the video ad production landscape with high quality work and a unique data driven approach, and their resume and bright future show that the only way for HeroLA.xyz is up. The Internet of Things has made its breakthrough into the mainstream with everything from home assistants to internet connected refrigerators, and the growing popularity of these devices has led to a boom in new IoT prototypes and designs. 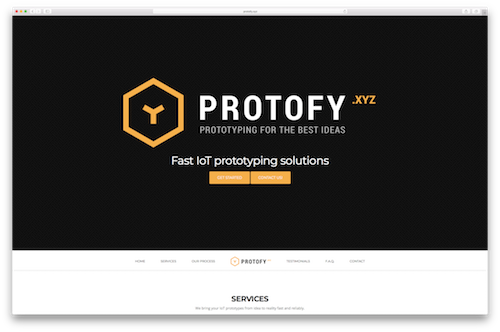 But ideas need to be turned into hardware to become a reality, and this week’s #WebsiteWednesday is the company that has all the skills your IoT idea needs: Protofy.xyz. Protofy.xyz brings IoT prototypes to life by providing all aspects of services along the production chain, including electronic development and circuitry, mechanical development of parts and actuators, and even web page and app development. Their process is fast, reliable, and guaranteed to be of the highest quality, and Protofy.xyz will stay in touch with you as often as you need during the entire cooperative development process. The Protofy.xyz team has experience working with a wide range of clients, and welcomes anyone to use their expertise. Whether you’re an inventor in need of some physical production or a marketing team sitting on the next big IoT idea, Protofy has the right tools and skills to take your IoT product to the finish line and have it ready to be distributed to the masses. Being on the cutting edge of innovation is what #GenXYZ is all about, and Protofy.xyz serves as a perfect example of how .xyz adopters are flexing their skills and pushing the biggest technological developments forward. With a memorable name and great team to match, Protofy.xyz is set to continue as a leader in the IoT industry for years to come.